A modern house located in a popular area of Chard, within walking distance to the town centre, whilst being on the edge of Chard. 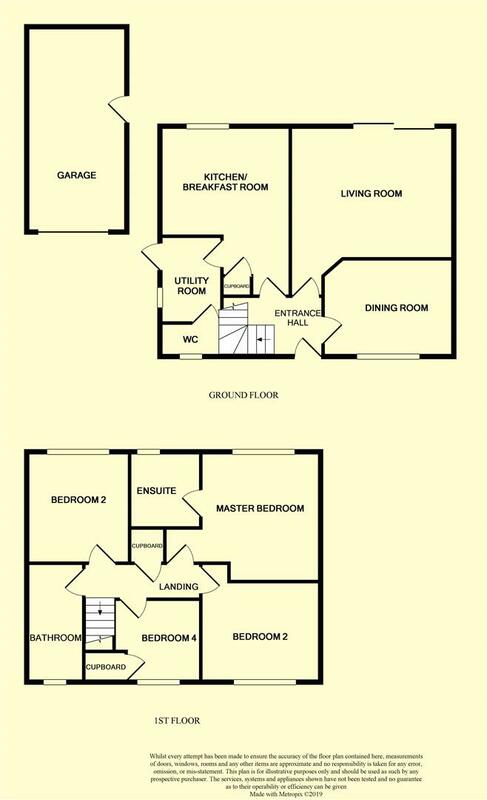 Accommodation comprises : four bedrooms, en-suite, family bathroom, lounge, dining room/ home office, kitchen/diner, utility room, cloakroom, entrance hall, garden and garage. The property benefits from gas central heating & upvc double glazing. No Chain. Lounge - 4.85m x 3.75m (15'10" x 12'3") - Upvc double glazed sliding patio doors, TV point, telephone point, two radiators, carpet. Dining Room - 3.70m x 2.75m (12'1" x 9'0" ) - Upvc double glazed window to front, space for 8 seat dining room table, carpet, radaitor. Kitchen / Breakfast Room - 4.25m x 3.70m (13'11" x 12'1") - Upvc double glazed window to rear, range of kitchen units with worktops, inset sink with mixer tap and drainer, built-in electric 'Belling' oven, inset gas hob with stainless steel extractor hood above, space for fridge/freezer, splash back tiling, crabtree switch for the applicances, vinyl flooring, ample space for kitchen breakfast table, radiator. Door to utility room. Wc - Upvc double glazed obscured window to side, low level WC, radiator, wash hand basin, splash back tiling, extractor fan, wall mount electric box, vinyl flooring. Landing - Upvc double glazed window to front, radiator, loft hatch, air cupboard housing the immersion tank, doors to . Master Bedrooms - 3.60m x 3.50m (11'9" x 11'5") - Upvc double glazed window to front, space for wardrobes, carpet, radiator, TV point. Master Ensuite - 2.00m x 2.15m (6'6" x 7'0") - Upvc obscured double glazed window to front, double shower cubicle with thermostatic shower, extractor fan, wash hand basin, splash back tiling, shaver point, radiator. Bedroom Two - 3.55m x 3.00m (11'7" x 9'10") - Upvc double glazed window to rear, carpet, radiator. Bedroom Three - 3.00m x 2.90m (9'10" x 9'6") - Upvc double glazed window to rear, carpet, radiator. Bedroom Four - Upvc double glazed window front, carpet, radiator. Bathroom - 3.52m x 1.66m (11'6" x 5'5") - Upvc double glazed obscured, white suite comprising : bath with mixer taps, shower cubicle with thermostatic shower, wash hand basin with pedestal, extractor fan, vinyl floor, radiator, shaver point. Front Garden - Wrought iron rail, with a gated entrance, mainly gravelled with decorative shrubs. Path leading to the front door. Rear Garden - Immaculately landscaped rear garden with a large patio area off the lounge, decorative gravel with a range of flower beds surrounding with a further patio area. Path leading to the side of the property. Access to a side door to the garage. Garage - 5.15m x 2.60m (16'10" x 8'6") - Up and over garage door, power and light. Side pedestrian door. Driveway - Paved driveway, providing ample parking.